Looking for something on our website? See the Search feature at the bottom of this page. Click for larger image. An estimation of where blocks are located in the watershed. Blue= watershed. Red= proposed roads that are going to be developed/used. Yellow = cutblocks. This is a visual simulation photo, produced by Kalesnikoff Lumber Company that shows how the cut blocks will be visible from the ferry landing. Closer shot of Block 66-2 (renamed 75-2) and the McPhee blocks. These will likely be the first of many along that mountainside of beautiful forest that is (was) seen along Hwy3a coming from the Junction to Castlegar. 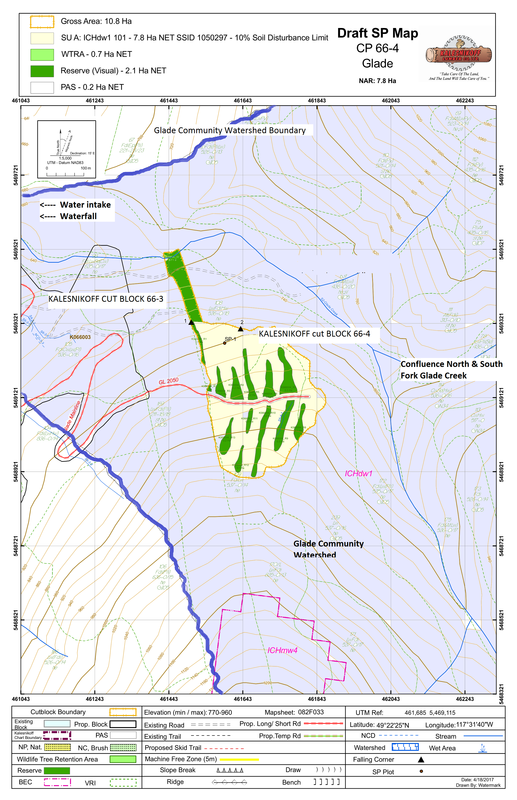 Kalesnikoff Lumber Company initially commissioned Terrain Stability mapping for Glade Face (South), Goose Creek and Hall Creek and Terrain Stability Mapping of Glade Creek and Gander/McDermid Creek in March of 2007. They began flagging in 2015 in Glade Creek Watershed. Part of KLC's cut block 66-3. 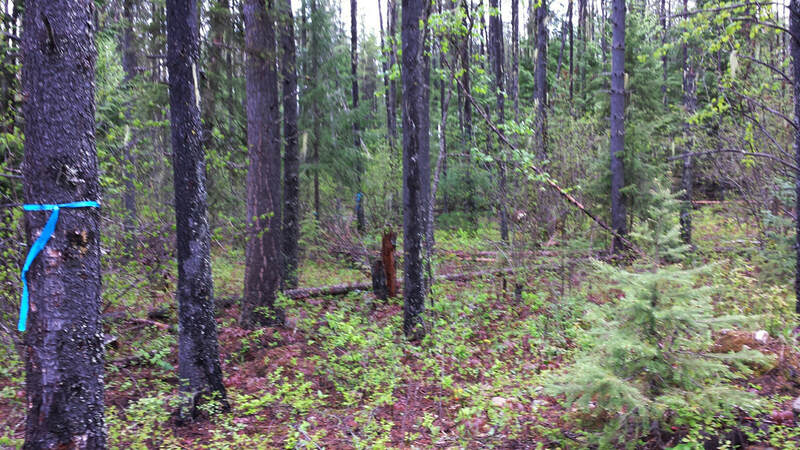 According to the KLC rep, this area is going to be clearcut and 40% of it will be burned as slash. 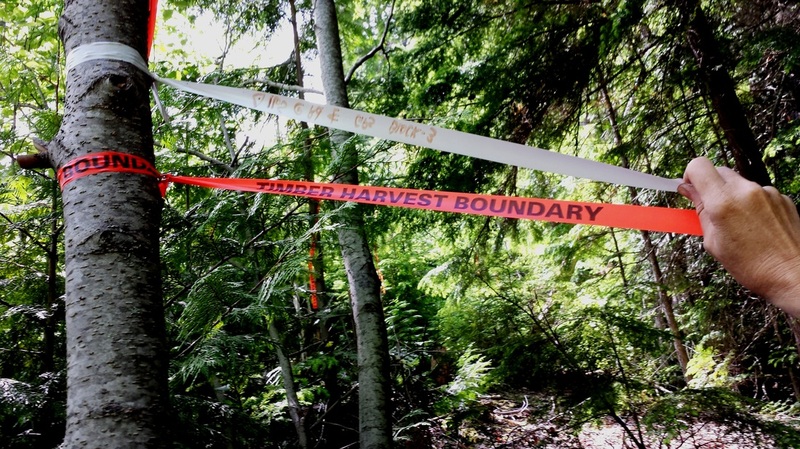 Although government legislation expects the logging companies to consider cumulative effects in their objectives, the industry no longer has to plan out their cuts in advance. The method they now use is to plan a couple of cut blocks, then do a couple more, and a couple more, etc. So although we are presented with the information for three blocks (and now a fourth), keep in mind that there are more cut blocks to come. 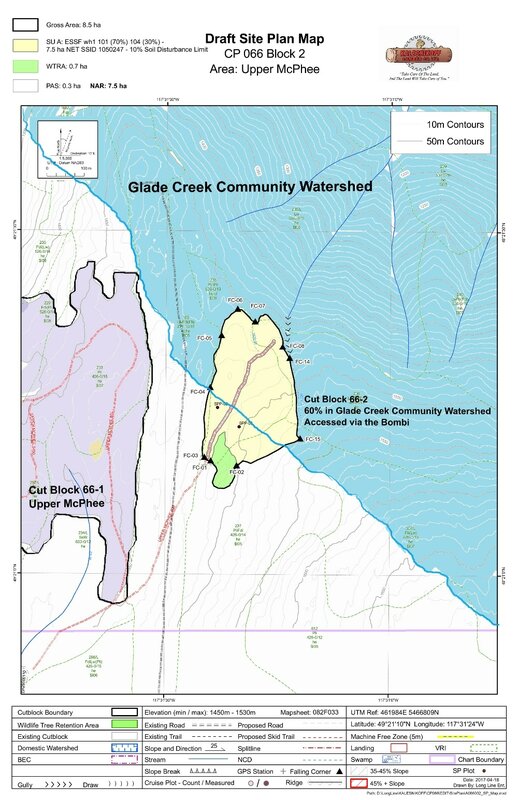 KLC has three cutblocks planned for Glade Creek Watershed. One is completely within our watershed, the other two are about 50% and 60% within Glade Watershed. 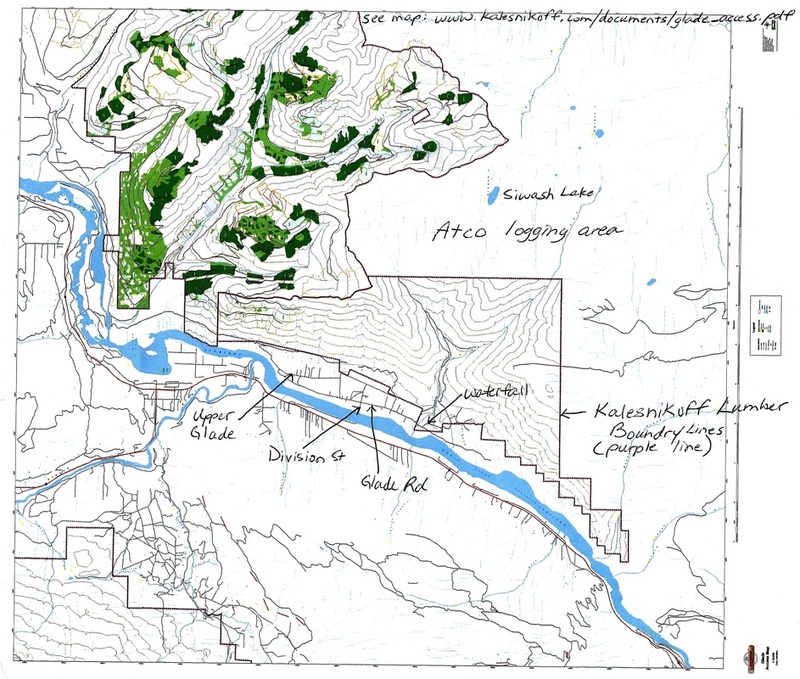 The contour maps are below, edited to show Glade Watershed boundaries, which are not included on the KLC website. They have another cut block planned above the community in North Glade, we have not received any maps for this one yet. Click on all maps to enlarge. 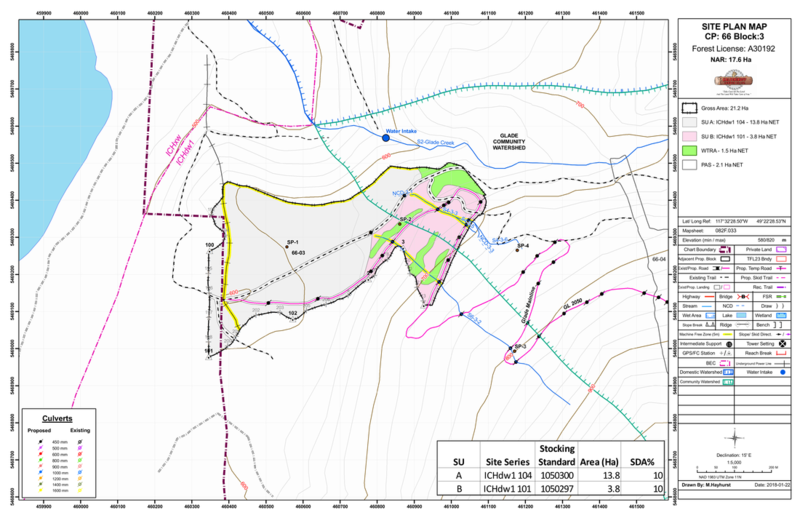 Draft map of proposed cut block 66-2 showing Watershed boundary. Now named 75-2. Glade Creek Watershed as seen from Hwy 3a. The blue building is part of Kalesnikoff's lumber yard. 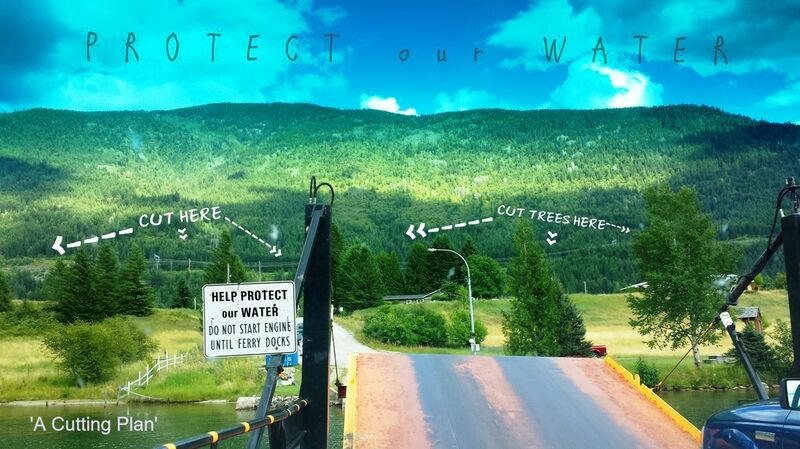 IE: from their lumber yard across the Kootenay River, they can see our watershed. We can also hear the noise from their lumberyard, which carries down the hill and across the river to Glade. 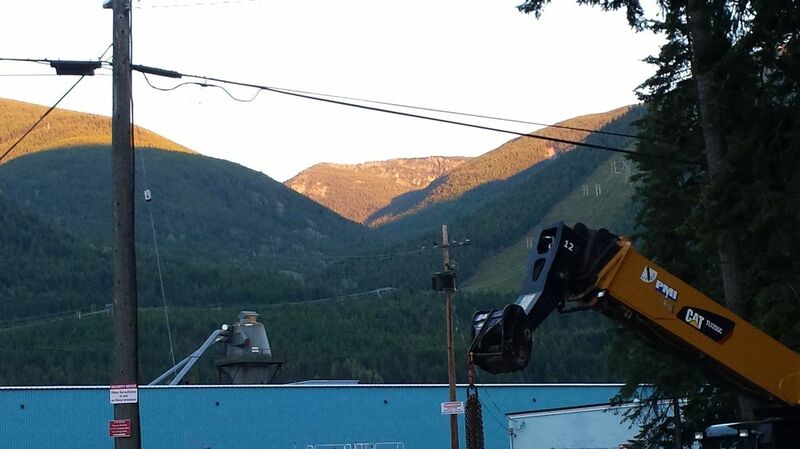 Vibration that shakes residents' windows, the loud noise of logs dropping, and the whine of machinery. It has been the source of numerous complaints, and although Kalesnikoff has tried to 'mitigate' the noise; it unfortunately still carries on today. March 2016. On page 43 they have a list of complaints received from members of the public. There are 110 complaints concerning 'quantity and quality of water'. 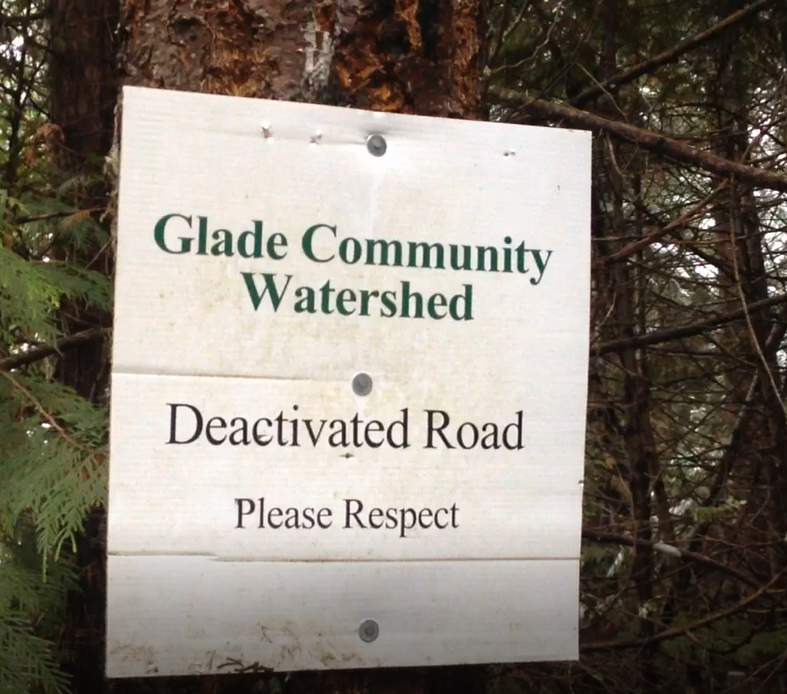 However, the Kalesnikoff Plan states that these numbers are "biased due to a petition received from Glade residents" concerning development in their watershed. Oct 2015 Kalesnikoff's 5 year plan in the Kootenays.